Cotton rope is just so... yesterday! And really, so are we! The first Pawleys Island cotton-rope hammock, handcrafted by South Carolina riverboat captain Joshua John "Cap'n Josh" Ward in 1889, remains the heart of our brand even now, more than a century down the line. We've seen countless copies and knockoffs of Cap'n Josh's inspired design through the years, yet in the end, there's only ever been one Original. Since those now-distant days of Cap'n Josh, we've continually improved upon our core materials and, where it's made sense to, expanded our line of products. 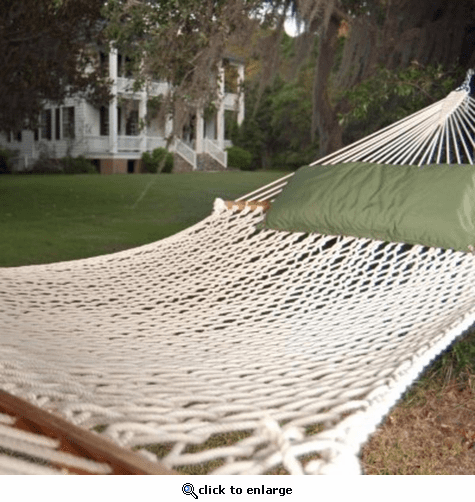 In addition to our classic cotton-rope Original, we now also offer rope hammocks in all-weather, cottony-soft DuraCord and soft-spun white polyester, as well as a selection of richly designed fabric hammocks, hammock-inspired swings, hammock stands, swing stands and key relaxation accessories. So while you may not have come to our brand in the same way you might have in years gone by, please know that our promise to you remains the same today as it has been for more than 120 years now: craftsmanship, quality and tradition woven together in a slice of that relaxed live-oak lifestyle of the old coastal South, right there in your own back yard, wherever in the world your own back yard may be!